It is an exciting week for First Coast Rotaract. 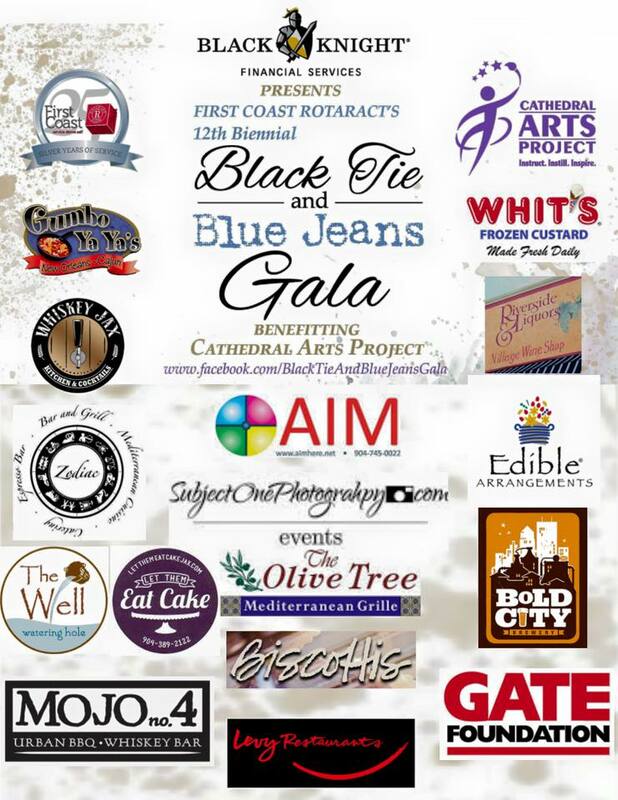 This coming Saturday is our signature event, the Black Tie and Blue Jeans Gala. There will be great food, a complimentary bar, fun music, an assortment of raffle prizes, and all to support a wonderful program,The Cathedral Arts Project. Tickets are still available, and we would love to see you there. Just to follow up on last week’s meeting, we will be holding board elections very soon. What makes this club so great is the transition of members to board positions to help lead and shape this club. Please look over the board position descriptions and reach out to the current board to find out more information. Nominations will begin on May 4th. Please let others know between now and then what positions you are interested in. 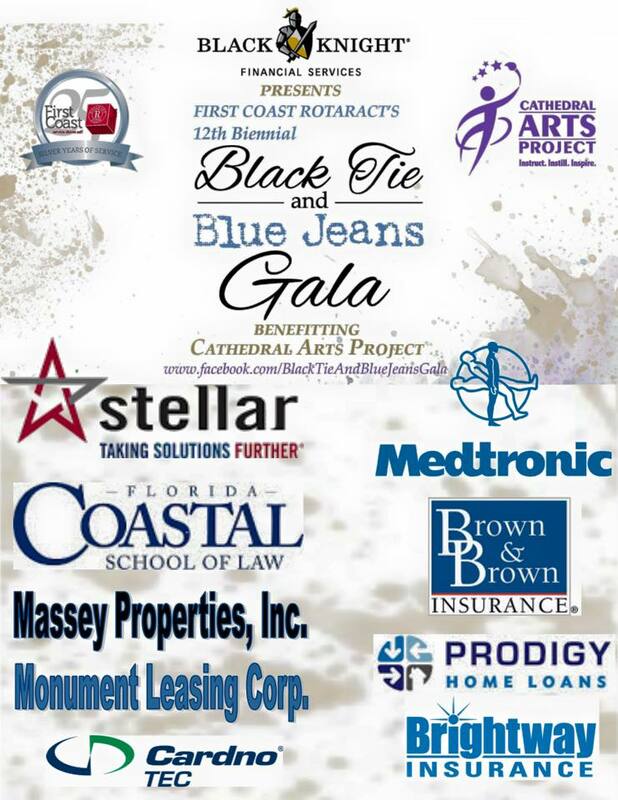 First Coast Rotaract is pleased to announce the Cathedral Arts Project as the beneficiary of the 12th Biennial Black Tie & Blue Jeans Gala. 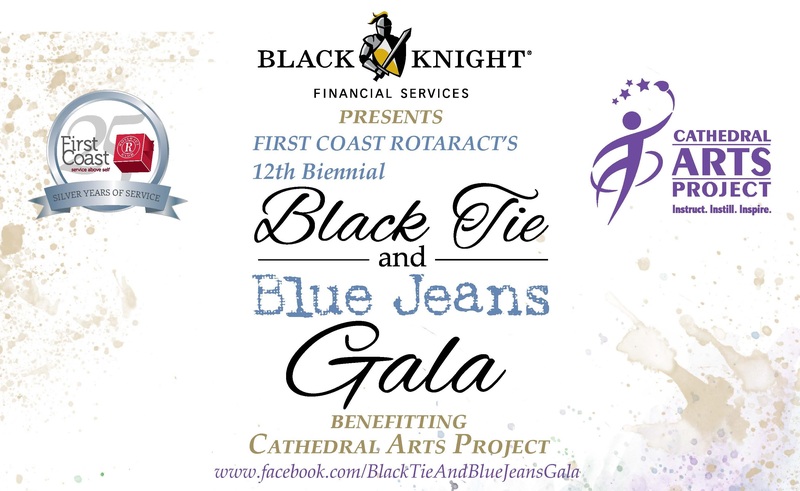 The event is a charity fundraiser put on by First Coast Rotaract and sponsored by Black Knight Financial. Cathedral Arts Project’s mission is to enrich the quality of life in Northeast Florida by unleashing the creative spirit of children in the local community. Rotaract’s goal is to supply over 200 of their visual arts students with art backpacks. Over the past 12 years, the gala has raised more than $160,000 for various organizations, including Big Fun Box, JLG Brain Cancer Foundation, and the Ronald McDonald House. Attendees sporting a mix of black tie and blue jeans attire will enjoy an open bar, hors d’oeuvres from local restaurants, live music, and raffle items. Tickets can be purchased in advance for only $50 per person and can be purchased either online or from any First Coast Rotaract member. Thank you to the many monetary and in-kind sponsors who help make this event possible. Do you remember when you were a kid and thought you were awesome at everything? 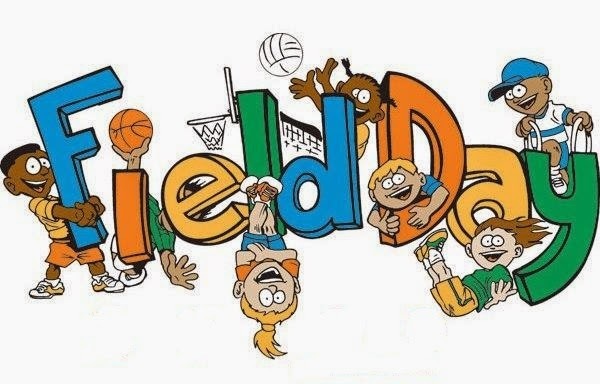 Now here’s your chance to prove to everyone that you are as awesome as you thought and show your skills at the Rotaract Field Day Extravaganza. Beaches Rotaract, Downtown Rotaract Jax, and Rotaract of Florida’s First Coast are teaming up to put on an awesome joint club event! I know it sounds fancy, but don’t worry it’s just an afternoon filled with fun nostalgic activities like 3 legged races and tug of war. If you’re not a really physical person don’t worry most of these activities are all about team work and using your head. It’s going to be an amazing afternoon filled with laughing at your self and most importantly laughing at each together. Everyone is strongly encouraged to join and all friends and guests are welcomed to participate because the more the merrier. Please see the Facebook page for details and to sign up.